General Blanque was the head of the Federation military. He is a ruthless soldier and will use any means necessary to win. He was aided by his assistant, Lonae. A glorified general in the Human Federation (“Federat”), stationed on the planet of D’hoonib at the far side of the galaxy. He once pressured Professor Honeycutt into developing a transportationalTransmat Device, one that would be used to teleport bombs and such inside the hulls of enemy craft. This would have been instrumental in the war with the savage Triceratons of the Triceraton Republic. 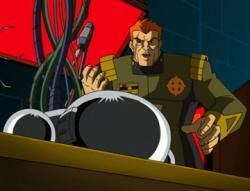 After an accident resulted in Honeycutt’s consciousness being transferred into the body of his android assistant, Blanque ordered the immediate capture of Honeycutt, declaring the professor a “Fugitoid.” When the Turtles transmatted from Earth and the TCRI’s building to Peblak City on D’hoonib, Blanque believed them allied with Honeycutt and, as such, ordered them captured along with Honeycutt. The Turtles, however, avoided his reach, losing the Federation as they found themselves in the middle of a Triceraton invasion (TMNT Vol. 1, #5). The Federation has been in war with the Triceratons for a long time. Blanque wanted the teleportal device created by Professor Honeycuttin order to win the war and defeat the Triceratons once and for all, but Honeycutt flat out refused, as he built it for peaceful purposes. But when he found out about an accident which transferred Honeycutt’s mind into a body of a robot, Blanque decided to capture the robot, now known as the Fugitoid, and extract the information. He sent his soldiers to capture him, but his plans were hampered by the unexpected arrival of the Turtles, who decided to protect Honeycutt from both the Federation and the Triceratons. The Turtles and the Fugitoid had managed to evade capture until they were trapped in an uninhabited planet where they were surrounded by the Federation and the Triceratons. Fortunately for them, they were inexplicitely teleported away. When the Fugitoid arrived on Earth after the initial Triceraton invasion, Blanque allied himself with Agent Bishopwho helped him capture the Turtles in exchange with the Fugitoid. However the Fugitoid had already erased information pertaining to the teleportal and unleashed a virus that stopped all Federation and Triceraton air fleets, sacrificing himself in the process. Blanque was last seen in a cell adjacent to Zanramon, the former leader of the Triceraton Republic, and arguing between the two commenced.